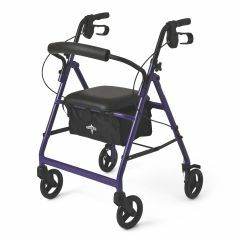 AllegroMedical.com presents The Basic Freedom Rollator. Our most affordable rollator yet! onstructed of a durable powder coated steel, this rollator accommodates users up to 350 lbs. Comes standard with convenient storage bag under the seat. Hand grips can adjust to your height: measure 31" from floor in lowest position or 35" from floor in highest position. Handles are height adjustable in 1" increments. Includes nylon basket underneath seat. Seat dimensions are 12" x 12". Wheel brakes lock for safety by either pushing down or pulling up for safety while sitting or standing. My mom loves it ! Well Constructed. Easy To Use. Supports Weight. Safe. This rollator has been such a great help for my 87 yr old mother. She had been using a standard walker with two wheels, but found it difficult to maneuver turns and it didnot move smoothly. She loved the rollator from the first time she used it. Well Constructed. Easy To Use. Supports Weight. Safe. Lightweight. Stores Easily. Indoors. Long Distances. Short Distances. Wet Weather. Outdoors. I got this for my Dad, who is 86, has Parkinson's and is blind in one eye. After a few days of use, I can't imagine how he ever got along without it. He had the old style walker and this one is so superior and so much easier for him to use and control. It was extremely easy to put together. I did it in a matter of a few minutes. I highly recommend this walker! Thank you. GREAT walker! I have 3 of them. Indoors. Short Distances. Wet Weather. Outdoors. LOVE this walker! I have 3 of them for different locations. We have compared others, very pleased! Indoors. Long Distances. Short Distances. Outdoors. Tried others and this is the best by far! Well Constructed. Easy To Use. Supports Weight. Safe. Lightweight. Stores Easily. Well Constructed. Easy To Use. Supports Weight. Safe. Lightweight. Stores Easily. What is width of rollator? Do you have to put you whole thing together, or does it come assembled? Asked on Mar 21, 2015 1:21:04 PM by Barb from Bowie, Md. Do you have a seat width of 22" within the handle bars. Most seem to be 18" and that is too small for me. My mom is small: 5 feet tall and 110 pounds at the most. I want one that she fits in without being "swallowed" up. Where do I find the seat dimensions. I would like to know if you can get a replacement seat for the Guardian Rollator. I accidentally put a small tear in the padded seat. Get and industial staple gun (Harbor Frieghts $7) and go to the closest fabric store to find a sturdy piece of upholstery fabic and staple it around the seat. I need (1) one wheel for a basic guardian rollator. Do you stock them? How much weight does a walker support? A friend of mine is in need and she is maybe 225 lbs? Asked on Oct 18, 2011 7:27:26 PM by Bordercollie from Mount Vernon WA. Can bigger wheels be added to the rollator? In my neighborhood you have to walk in the street and it's so bumpy, I can't walk with it. Now if it had bigger ,more heavy duty wheels I could. I love mine. What is the wheel diameter for the Basic Rollator? 4, 5, or 6 inch. is this adjustable for highth of person? Hand grips can adjust to your height: measure 31" from floor in lowest position or 35" from floor in highest position. They go up in 1" increments. Is the basic rollator is cover by medi=care or medi=cade? How difficult is the assembly? can an average person do it? This rollator is very easy to assemble. It took me about 10 minutes to have it ready to roll.